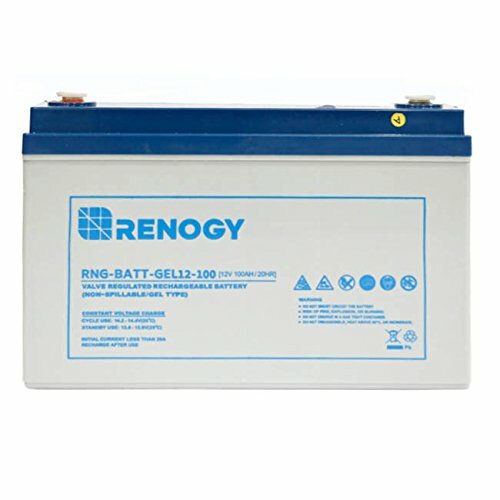 Patent Designed Construction: Renogy batteries are equipped with PE compound separator construction, which ensures that gel electrolyte is distributed evenly through-out the inner battery and ensures the best evenness of all parts of the battery. 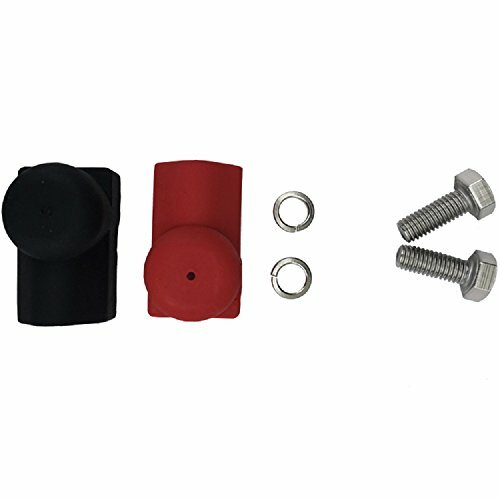 Triplex Sealed Construction: Valve regulated sealed construction and triplex strengthened sealing on terminals and posts prevent electrolyte leakage, and guarantee the air tight and liquid state of batteries in normal operation and prevent external air form entering battery inner. The 12V 100Ah Renogy Deep Cycle Pure GEL Battery is a part of the DG (Deep Cycle GEL, 12 Volts) series which are pure GEL batteries. Using strong grids, high purity lead, and patented Gel electrolyte, the DG series offers excellent recovery after deep discharge under frequent cyclic discharge use, and can deliver 1000 cycles at 50% DOD. 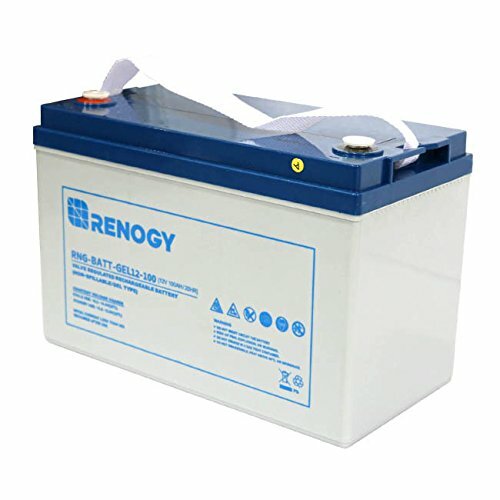 The 12V 100Ah Renogy Deep Cycle Pure GEL Battery is the perfect addition to your solar power system. High Efficiency of Recovery: Unique formulas are used in lead paste of positive post and ensure the battery can be recharged easily to a normal level. No Electrolyte Stratification: Special additives are use in electrolyte to give it a gelatinous consistency without flowing, leaking or stratification, and make all parts of plates react evenly. Low Self Discharge: Because of the use of lead-calcium grids alloy, Renogy batteries have low self-discharge and reliable performance. In room temperature, self-discharge ratio per month of Renogy battery is about 3% of the battery capacity. High Security: Renogy batteries are equipped with explosion-proof safety valves to prevent production of redundant gas. And the construction is designed to prevent setting fire to the internal battery in case sparkles approach.